Guiding Yoga’s Light: Lessons for Yoga Teachers moves beyond the anatomical aspects of asanas to help instructors present the deeper concepts of yogic philosophy to their students and offer insight into the integration of yogic teachings into everyday life. 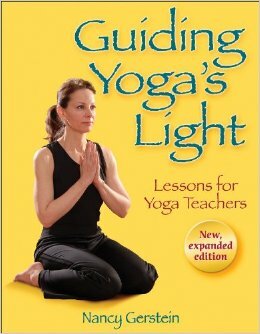 Now in an updated, expanded edition, Guiding Yoga’s Light presents 74 easy-to-follow, succinct lesson plans offering instruction in hatha yoga, including asana, pranayama, the yamas and niyamas, the chakras, creating mindfulness, and understanding emotions. The text also includes three new, teacher-requested chapters: Salutations in Motion, Lessons of the Heart Center, and Relaxation. For convenient reference, teachers and students can also refer to the vocabulary of Sanskrit pronunciations included in the glossary. Asanas for deepening illustrate and incorporate the lesson through body stretch, movement, and sensation.